Water Balls © 1996 ABM Electronics. 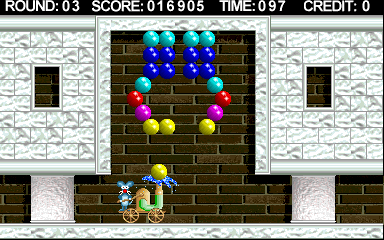 A "Puzzle Bobble" style game. The players controls a comic mouse that controls a tiny fire old engine you must eject the water to catch the falling colors balls (you can also change the color) for then eject again to hit them with balls of the same color for complete the level. The initials input music is John Philip Sousa's 'Liberty Bell March' (also recognized as the Monty Python theme). At the game over screen, 'Game over, man!' from the 1986 movie Aliens is played.